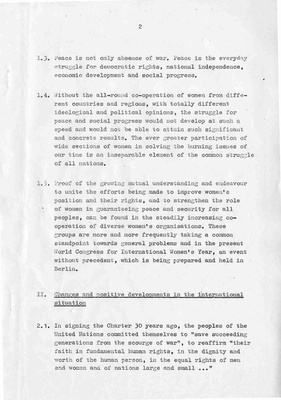 "International Women's Year, Berlin Paper, page 2"
Page two of a working paper by Commission VI for the International Women's Year World Congress held in Berlin, October, 1975. The Commission wrote on women and peace, detente, protection of the environment, and international security. "International Women's Year, Berlin Paper, page 2" (1975). Washington State Conference for Women, 1977. 247.